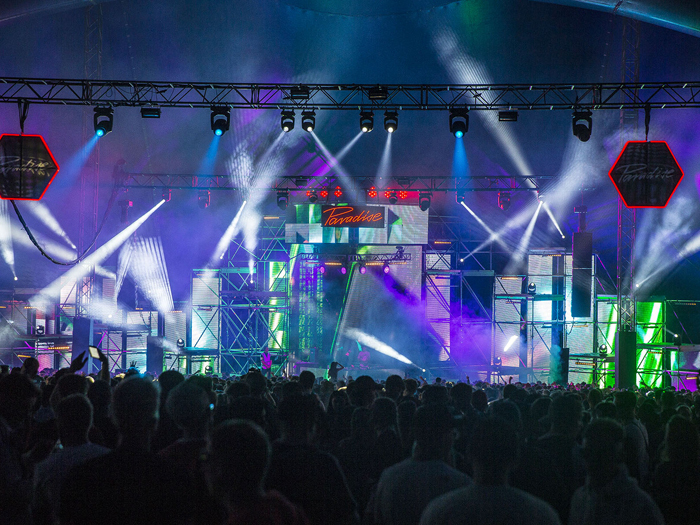 UK: Colour Sound Experiment supplied lighting, rigging and Kinesys automation to two high profile arenas at this year’s Creamfields, staged in Daresbury, UK. The festival was a memorable one for many reasons, including the brand new Steel Yard venue – a 50 metre wide by 100 metres long space offering up to 26 metres of headroom with a capacity of around 9,000, designed and built especially for Creamfields by Acorn Structures. Colour Sound also provided lighting and rigging for the CF 06 arena, used to present three dynamically different nights over the – club phenomenon Paradise, UK DJ and radio presenter MistaJam’s ‘Jam Packed’, and US DJ MK’s ‘MK Area 10’ on the Sunday. The lighting design for the Steel Yard structure was created by Dave Kyle for Colour Sound, working closely with Colour Sound’s Fletch – who fine-tuned it to fit harmoniously into the massive roof space. It was an ambitious and offbeat design that included flying lighting pods over the audience. Colour Sound also asked Simon Barrington to operate lighting for Steel Yard, who brought his vast wealth of EDM lighting and visuals experience to the party. Sixty rigging points were installed in the roof by Colour Sound’s riggers – Jamie Hogan, Toby Lovegrove and Az Khalid – including bridles and spreader trusses to distribute loads and get everything in exactly the right place. Colour Sound also provided the required rigging for video supplier PRG XL Video and audio company Britannia Row as well as all its own lighting points. Over the stage three lighting trusses were sub-hung from the video trusses, four more lighting trusses rigged in the wings and four vertical ‘totems’ were positioned onstage which were shared between lighting and video, with another two used exclusively for lighting. The onstage lighting fixtures were 36 x Clay Paky Sharpies, 36 x Martin Atomic strobes plus 30 x Showtec Sunstrips, which delineated the vertical profiles of the onstage trusses and mimicked the form of the LED screens. Barrington undertook extensive pre-visualisation work using Capture, which helped onsite as time was exceptionally tight. Out in the Steel Yard arena, the lighting took on an architectural aesthetic to compliment the raw industrial magnitude of Steel Yard’s interior, with a 10-metre circular truss in the centre surrounded by eight 4-metre equilateral triangle truss pods, each moving on three axes of Kinesys driven Liftket motors. Either end of this, at the top and bottom of the arena, were two eight-metre trussing triangles – four in total – which remained static. The smaller triangles were each rigged with three CP Alpha Spot 1500s on the truss apexes, together with two 2-lite Moles and an Atomic strobe, and they were also filled with Stealth LED video mesh. The larger triangles each featured six Sharpies, four Sunstrips and three Robe LEDWash 1200s, with eight Robe LEDWash 1200s provided the main wash lights on the circle. Choosing powerful fixtures like the LEDWash 1200 and the Alpha Spot 1500 enabled the vast space to be filled with intense beams of light and the audience to be pulled into the action with the tight, bright Sharpies punching through for contrast. The moving triangles dramatically added to the scope of the design. Barrington operated using a ChamSys MQ200 and also ensured that any guest LDs had all the facilities and assistance they required. The asymmetric stage design of CF 06 gave the arena a unique visual edge, together with the random and slightly chaotic 24-metre wide seven-metre high scaffolding stage set, harkening back to the early days of pop-up warehouse parties. Fifty Sunstrips were rigged directly to the scaffolding, following the flow of the asymmetry. Six i-Pix BB7 (the famous flower shaped ones) and four Robe LEDWash 600s made up the ‘crown’ which was cantilevered out over the DJ booth. Both lighting fixtures and video elements sub-hung from it, all of which were pixel mapped for additional flexibility. At the core of the stage lighting were 28 x Robe Pointes, with another 10 upstage shooting through the scaffolding and video mesh, paired with 10 x Atomics. Out in the room, three 18 metre trusses were flown from the tent king poles, each loaded with four BMFL Spots, four Pointes and two Atomics. The DJs were illuminated from two LEDWash 1200s on the downstage edge of the stage, shooting across, with all lighting run via a ChamSys MQ80 operated in shifts by Toby Lovegrove and Doug Coppell, with Mel Cornish as the systems tech. The other Colour Sound crew members – not already mentioned – working between the two arenas were Katie Flanders, Lewis Beal and James Bunning.